Australian-based Paladin Energy has announced expansion plans for both its Langer Heinrich and Kayelekera uranium mines, but has revised its 2010 production forecasts downwards. 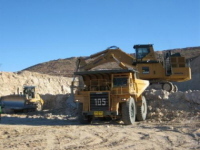 The company has announced that in-house studies have shown that annual production of around 10 million lb U3O8 (3846 tU) at the Langer Heinrich mine in Namibia would be sustainable for current mineral resources, but the company has decided that production of 9 million lb (3462 tU) per year would achieve the best balance of maximising value and maintaining a long-term profile. This output would, it says, result in a mine life of 15 years and could also possibly be supplemented by a 1 million lb U3O8 (385 tU) per year heap leaching facility. This would represent the fourth wave of expansion at the mine. Quarterly results just released by Paladin show the mine to be operating at 90% of its current nameplate capacity, and it should achieve its full 3.7 million lb (1423 tU) per year capacity by the end of 2009, says Paladin. Although the ramp-up of production at the Kayelekera mine in Malawi is behind schedule, Paladin says that it is still on target to reach its nameplate capacity of 3.3 million lb (1270 tU) per year by March 2010. The company says it will also conduct an optimisation study to exploit additional resources by extending the current pit, with the target of increasing production to 3.8 million lbs (1462 tU) per year by 2012. In total, the expansion plans would see Paladin's African projects producing approximately 13.8 million lb U3O8 (5308 tU) per year by mid-2014. Nevertheless, the company has revised its overall production projections for the 2010 financial year from 6.6 million lb U3O8 (2540 tU) down to 5.6-6.1 million lb (2154-2346 tU), citing slower than expected production ramp-ups.